Were you still connected to the internet when you ran this? It’s very strange that you keep getting these errors resolving host names. I’m beginning to wonder if it’s a problem with your internet service provider and not with Endless OS itself. @wjt @dan thoughts on this one? But then you hit the networking problems. You can just keep running this script until it succeeds, though. It will just pick up where it left off. You can just paste the output in your reply. Thanks! Hello, connoisseurs. I have a similar problem. The AppCenter informs me of an update to the Endless Platform, but when I click Update, the line disappears for a few seconds, and then it reappears. What’s interesting is that the update has been installed through the terminal. It’s not a problem, just a little annoying. Thanks for answer. Sorry, I read the whole thread, but i’m did not to do it immediately. Tonight, when I’m being at home, I’ll definitely do it and attach the file. Now I tried to run the script several times, but nothing has changed. It always had stopped at the same time and now it is not working at all. I will try the update in an other ones wifi, when I get the time to do that. When your guesses are right it should work in a well-performing network?! If it’s something strange about your particular network yes, that should make it work. @LeandroStanger Well, were there any oddities? Well, were there any oddities? Ok. Thanks, I’ll be wait. @NofFyddink I think that is a known, and harmless, problem. But the log doesn’t actually have anything relevant in it. Can you reboot your computer; launch the app center; reproduce the problem (click update, wait for the line to disappear and reappear); then re-run eos-diagnostics and attach the new log here. Ok, i’ll do it later. 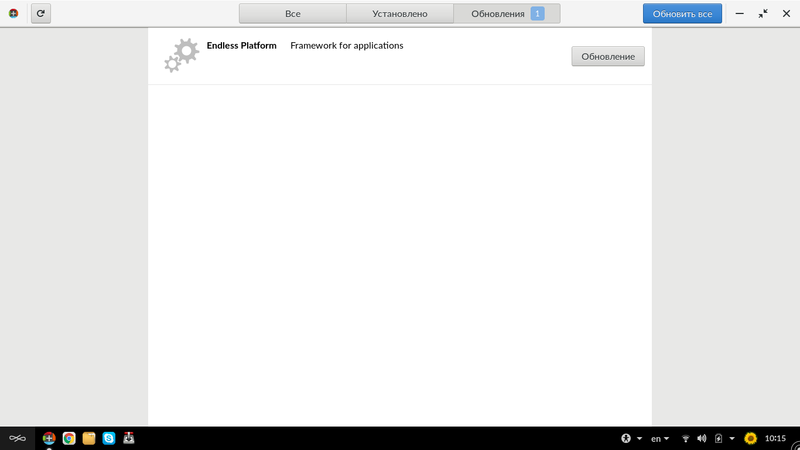 сен 20 20:53:41 endless gnome-software-service.desktop: 17:53:41:0058 GsPluginEos system/flatpak/*/runtime/com.endlessm.apps.Platform/1 runtime cannot have runtime! сен 20 20:53:41 endless gnome-software-service.desktop: 17:53:41:0061 GsPluginEos system/flatpak/eos-sdk/runtime/com.endlessm.apps.Platform/1 runtime cannot have runtime! сен 20 20:53:41 endless gnome-software-service.desktop: 17:53:41:0064 GsPluginEos system/flatpak/*/runtime/org.gnome.Platform/3.22 runtime cannot have runtime! сен 20 20:53:41 endless gnome-software-service.desktop: 17:53:41:0066 GsPluginEos system/flatpak/gnome/runtime/org.gnome.Platform/3.22 runtime cannot have runtime! сен 20 20:53:48 endless gnome-software-service.desktop: 17:53:48:0198 GsPluginEos system/flatpak/eos-sdk/runtime/com.endlessm.apps.Platform/1 runtime cannot have runtime! I believe this is going to be fixed with the 3.3.0 update. Good. And is there information - when will the update be released?